Chris is a big kid at heart, and you’ll find his energy infectious as you set out on your adventure together! He and his helmet pal, Wilson, can be found climbing and mountaineering in Yosemite, Joshua Tree, Idlewyld, the Sierras, the Cascades, the Rockies, Devil’s Tower, Sao Paulo, and the flatlands of the midwest when they’re not running around Wrangell-St. Elias. In the 1990s, he married his twin passions, climbing and water sports, by taking up ice climbing on frozen waterfalls and glaciers. 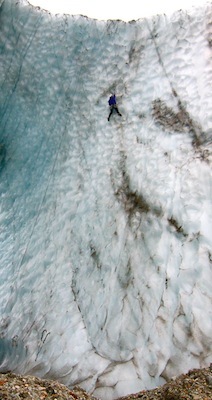 He’s also the first to jump into a blue pool on the glacier, and he’ll do his best to talk you into joining! 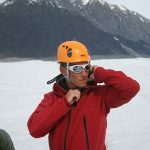 Chris is a certified Wilderness First Responder/ CPR, and has AIARE Avalanche Level 1 training. He enjoys showing everyone the wonders of the outdoors and teaching them the skills to get the most out of the wilderness. 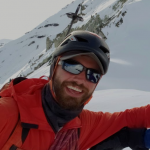 Chris helped pioneer our latest backpacking trip offering, the Chugach Mountain Circuit, and loves it’s rugged alpine beauty.